Imagine a world where business or management research is used widely in practice by business and other non-business organizations to improve the lives of people in our societies. 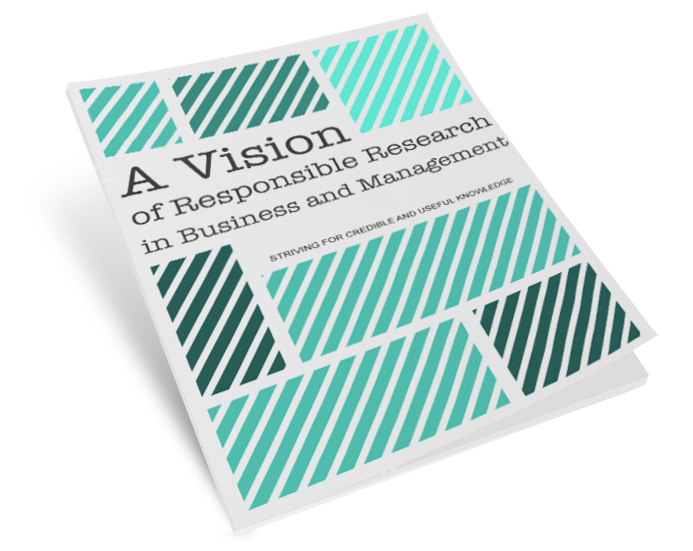 Read our Vision paper and join our effort to advance responsible research in business and management. Responsible Research for Business and Management (RRBM) is dedicated to inspiring, encouraging, and supporting credible and useful research in the business and management disciplines. It is a virtual organization initially developed by a group of 24 leading scholars in 5 disciplines at 23 university-based business schools in 10 countries and now joined by a much larger community. We have support from many partners, including AACSB, EFMD, PRME, Aspen Institute‘s Business and Society Program, GRLI, and many business schools worldwide. Read and register to “Voices”, our newsletter! Already more than 1000 supporters, join the movement, endorse here! This briefing 1 The content of this executive briefing is based on the position paper “A Vision of Responsible Research in Business and Management: Striving for Useful and Credible Knowledge” (cRRBM, 2017) presents a vision of business schools and scholars worldwide having successfully transformed their research toward responsible science, producing credible knowledge that is ultimately useful for addressing problems important to business and society. This vision is based on the belief that business can be a force for good when informed by knowledge from responsible research. Research is the foundation of business education and practice, yet research in business schools has been criticized for being weak in integrity and low in relevance. Responsible research ensures the production of credible knowledge that can be used to inform progressive government policies and promote positive business and management practices. It introduces seven principles to guide research with four focusing primarily on the usefulness of knowledge and three on the credibility of knowledge. It ends with a call for actions to transform business and management research toward achieving humanity’s highest aspirations for a better world. Several initiatives are already improving the utility, credibility, and assessment of responsible research across the global academic landscape. Read about some of the most exciting developments, learn how you might support these initiatives, and let us know of any other examplary practices that promote responsible business and management research at your school, among your colleagues, in your journal, and/or with your organization – and let us know who you are. Read what some business schools are doing to encourage, support and reward responsible research. Please tell us about any other inspiring programs at your school or other schools that we should share and feature. Editors and editorial boards are promoting responsible research through special issues. We encourage special issues in different disciplines. We are proud to highlight the following calls for papers and published issues. The Rotterdam School of Management, an institutional partner of RRBM, is hosting the leaders of the RRBM community at an invitation-only summit to develop actionable ideas for the next steps toward business and management research that can contribute to a better world. Watch Jeffrey Pfeffer on his RRBM-Awarded book. Please join us at upcoming presentations and let us know about other events that are of interest to our community. Read inspiring personal commitments to responsible research. Tell Us How You Can Help. If you agree with the vision of responsible business and management research in service of society and you are prepared to take actions to create this future, please describe a few actions that you plan to take and let us know who you are.